You’re running late and you haven’t eaten all day. You’re starving, your blood sugar is tanking, and you need a snack now. But wait! The vending machine is your only option. Americans have busy schedules. They have less time available to plan and prepare a meal. According to government research, half of all Americans eats three or more snacks per day. Two generations ago, snacking was reserved for working men, growing adolescents, and toddlers with small stomachs. Most Americans ate three square meals a day. Now, meal skipping is common place, especially at breakfast. For teens, snack foods eaten outside of a sit-down meal provide one-fourth to one-third of daily calorie intake. At work, school, and in public places, vending machines are often the only source of food for sale. But food and beverages typically found in vending machines are a problem: high in calories, low in nutrients, and full of unwanted ingredients. Vending machines are seen as a major contributor to the poor food choices that lead to overweight and obesity. Improved access to healthy food is a key strategy in obesity prevention, a matter of great interest to anyone concerned about medical costs. It started with the 2019 Healthy Hunger-Free Kids Act, the federal regulation that affected food in public schools. A provision, dubbed the Smart Snack Law, set new standards for snacks sold in schools. Snacks and beverages had to follow USDA’s “Smart Snacks in Schools,” nutrition standards: snacks were capped at 200 calories, 35% fat, 35% sugar, and 200 milligrams of salt. The main ingredient had to be a whole grain or contribute at least one of the main food groups: dairy, protein, fruits or vegetables. In a healthy vending machine, don’t expect to find fruit pies, Pop-tarts, snack cakes, fried chips, Cheez-Its, Skittles, Twix, or regular soda. Those foods are packed with sugar, fat, sodium, and empty calories. Do expect baked and whole grain chips, popcorn, sunflower kernels, peanuts and nuts, mini pretzels, rice cakes, snack mixes of cereal and dried fruit, fig bars, graham crackers, whole grain crackers, and whole grain granola-type bars made with unsaturated fat. In refrigerated healthy vending machines, there is bottled water, 100% juice, fresh fruit cups, low-fat yogurt and milk, string cheese, salads, and prepared sandwiches. 9 Japanese Vending Machines That Seem to Have it All! 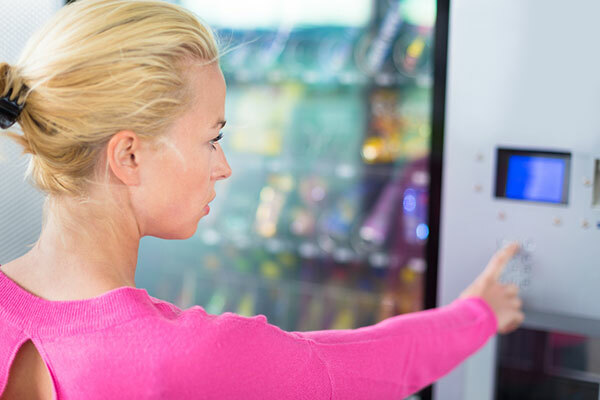 Many cities, including Chicago, San Francisco, Los Angeles, Seattle, and others, have enacted healthy vending machine regulations for city departments. In California, a new law signed by Governor Jerry Brown mandates healthy vending machines on all state properties. The public is warming up to vending machine changes. Studies have found that converting 50% of vending machine items to healthy options maintained or increased revenues. A new report of Chicago’s healthier snacks in parks initiative found that replacing standard vending machine fare with healthier snacks significantly increased total monthly sales from $84 to $371. Every single park staff member and 88% of park patrons reported liking the new healthier vending machines. To learn more about healthy vending machine initiatives, information is available from many organizations dedicated to improving access to healthy foods. The federal, state and local governments, as well as associations representing schools, workplace health, and the vending industry all have free information. The franchises that sell healthy vending machines are delighted to help, too.